OK, I'm really guessing now..... You might also check the connectors for the circuit boards you have on your machine. The plugs on mine fit into sockets on the board, but they also have screws that hold the wires into the plug. If yours is the same, make sure the wires are really being held by the screws by giving each wire a gentle tug to see if it comes out (with the machine unplugged of course). Cover interlock switches on mine prevent the laser from firing if the cover is open, but everything else works. If you have access to a good digital volt meter or o-scope, you might check to see if there's noise on the input line that controls the laser tube's firing (not the high voltage side). If you can set up the laser to some low power level, just enough that you can see the tube lighting up, you might try wiggling the wires or tapping lightly on the circuit board to see if that makes the tube flicker. Write a small gcode file or use the mach3 MDI screen so that it just turns the laser tube on steady instead of one that rasters an image so the tube should always be on at the same intensity. Or maybe make a gcode file that rasters a large black area so the laser's always on to some fixed and constant power level. How does mach3 control laser firing on your machine? if it's with the Z height for example, CV might be 'smoothing the path'. On my diode laser that caused problems especially if the range of movement on Z is small compared to the x and y stepover values. I had something strange happen last night. My computer is starting to be dumb in my IE and I have Norton 360. It took PEP4 laser out of my computer. At least that's what it said it did. The program still works fine so I do not know what it did. Just thought you might like to know. I am trying to get in touch with Norton I might have some virus or something. This is the power supply I have and it was the least expensive one I could find. It might be I should have bought a little better one but I am on a real tight budget. Also I am aware that you get what you pay for and I am considering what I got might be the problem. I am having some problem with IE on this computer before I proceed with my line problem I will need to address this. That's probably just Norton being overly zealous. Same thing sometimes happens with Avast. There should be a way for you to tell/set Norton to not panic. Having your computer connected to the internet and running an anti-virus program can cause all kinds of havoc with cnc controller programs, especially when using Mach3. In Norton, under settings/computer there are exclusion lists that you can add program names to exclude from autoprotect and/or scan checking. You might have to add the picengrave setup exe filename to those lists. Most of the files that I download have properties that show the file is blocked (right click on the filename, choose properties). If picengrave's properties is showing 'blocked', click the unblock button). You can use the windows task manager to see how much cpu is being used by each of the processes that are running (alt,control, delete to start the task manager, choose the processes tab, click on 'cpu' twice to sort the list so the high usage items start at the top of the list). to tell windows not to start things at windows startup time (start->run, type msconfig, then choose the startup tab, check disable all, click apply, and click ok to disable all items). You'll need to reboot the pc after that. On the reboot, you'll get a popup that asks if you want to run msconfig automatically on boot - choose no. As per your laser PSU, don't fret. Mine came with 'el Cheapo PSU at first as well and it ran without a hitch for a while until I burned it out doing something stupid while measuring the mA. I know quite a few guys who run the cheapo's without issue, though it wouldn't be bad to have some cooling on it for good measure. It does have heatsinks inside...might give you better stability. My psu doesn't look that much different, might even be the same. The makers of mine now recommend installing a fan on the psu for cooling. That made for an interesting afternoon - I'm betting they put the psu in first and then built the rest of the machine around it just to make the task more challenging. I do have a computer case fan I am going to install I am planning to force air into the psu from the top. On the last run I put a 110v desk fan blowing air over the whole psu, it improved the lines but not good enough to use yet. I don't know what speed to set my feed rate, it is at 150 inches/min. I am wondering if this might have something to do with the lines. The people that sold me the laser tube said I probably need a new power supply. We plan on trying some other stuff first. Jerry, I'm not sure how you're telling the laser to turn on/off with mach3, so I'm just guessing here, and assuming you're triggering it with a 5 volt ttl level for ON, and zero volts for OFF. You might try putting a digital voltmeter or a scope on the trigger input terminal and try to see what the trigger voltage is when the laser fails to fire. That should isolate the issue to either mach3 and the pc, or the laser psu if you can catch it. Mayber rastering a large black square would provide a good test case as it would have the laser on most of the time. Older pc's used ttl levels (zero and +5) on the parallel port outputs. Newer ones and laptops use less, and that might not be enough to reliably trigger a circuit that expects to see 0 and +5. Dave I'll try that but I get my 5V from my psu There is a 5V tap on the back and I run it through my breakout board. I am not sure if that would be the same 5V that triggers my TTL low but I will test it with the Fluke. Your assumption is correct about off/on with Mach. That black patch is a good idea. I ran a program with a ink pin earlier and it came out good, it is defiantly something in the laser circuit. You run the 5v power control through your BoB? Why? 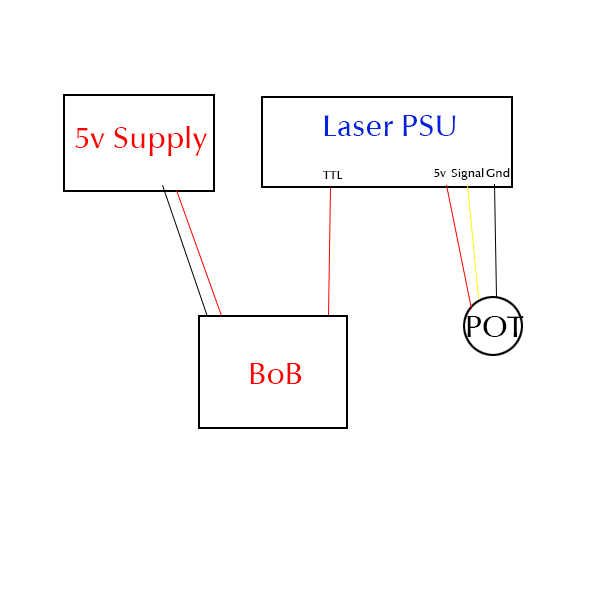 You should have your TTL that runs from your BoB to the signal input (on the PSU) and have your 5v from your PSU running to your POT and the resisted voltage running back to the power level input. The power control should be strictly with 5V, GND & IN on the PSU. The only thing going from your BoB to the PSU should be the TTL. Try just drawing out a shape instead of the intense on/off of using a PEP image. It will give you a more solid note of what is going on. Your TTL will either see 5v or 3.3v, the 3.3 is the alternate 'low power' version of flipping voltage but is technically suffice (though doesn't always translate well). If you see something I could do better please let me know. Sounds like you might be on to something Muk! I'm thinking that the parallel port ground pins (18-25?) or the BoB ground probably also needs to be connected to the laser psu ground pin??? You don't want anything running to your PSU from your BoB except the TTL wire (and emergency stop if you wire that up later, which usually gets wired into the WP = Water Pump Switch). Following what Dave said, your BoB's ground will connect to the parallel cables ground (the outer piece of metal outside the pins). Also, 18-25 are all grounds as well. Pins 10-15 on your BoB can be used for Homing switches if you haven't already installed those. That diagram looks good Muk. It took me a while to notice the yellow lead on the pot's center tap in the diagram. It looks like the BoB ground (in the lower right corner of the BoB photo) is the same as the parallel port ground (pins 18-25). I think that the BoB Gnd pin needs to be connected to the PSU Gnd pin in order to give the psu a reference to the ttl level on the BoB output pin that is used to turn the laser tube on/off. i.e. All the ground pins need to be at the same gnd voltage level. I'd also mention that there are really two grounds - frame ground and logic ground. They're different as frame ground is tied to the green wire in the 3-wire main power cord, logic ground is the gnd pin on the BoB and the laser psu and parallel port pins 18-25 and the negative side of the 5V power supply in Muk's diagram. Wouldn't hurt to try that out, good thinking Dave. I now have it running like the diag. Muk drew. I had a 5v power supply I was planning to use on my BoB before, and I put in a larger fan for the laser PSU. I did not run a ground with the TTL from anywhere cause I did not understand what you meant. Now a new twist. I drew a 6 inch x 6 inch black box and it did great It has a few little glitches but that is probably something to do with the wood grain. The MA is constant at around 4 to 6 MA adjustable with the POT. Study, nice lines and constant MA. I did not check the voltage yet. I am going to try Thick Black and White lines and see what's up. Now the stinker!!! Maybe I been chasing my tail cause PEP still does the same thing. It skips lines and leaves large spaces. I only ran that large drawing to see if it was better. It did a couple of more things I don't understand yet but one thing at a time. Have you tried just drawing some shapes or something of that sort in BoB cam? Just to rule out PEP? Please email me the PEP gcode file that is giving you the skipped lines so I can look at it. If you are generating an analog gcode file trying to engrave it with a TTL controller, then I suspect that could be your problem. You must dither an image first for TTL engraving.